It is now over a month since Typhoon Haiyan (called Yolanda in the Phillipines) struck the Philippines on 8/11/13. The worst hit provinces were Leyte and Eastern Samar, which experienced sustained winds of 270 kph, gusts of up to 312 kph, and a storm surge in coastal areas as high as 7 metres. Not all travel is for pleasure. Typhoon Haiyan travel advice is be prepared and be informed. 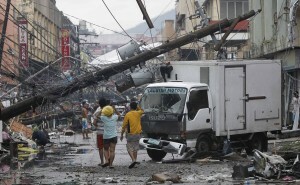 The official death toll from the Phillipines Government is approaching 6000, the injury toll 27000, and 1800 people as of mid December 2013 are still listed as missing. These figures are considered by most to be conservative. Enormous international aid efforts are underway. Significant infrastructure damage has caused problems with sanitation, food supply, electricity, transportation, shelter, communications, security, and medical care. This all has implications for people who are considering travelling with aid organisations, or in those visiting relatives and friends to help them. 2 Use mosquito repellents with more than 30% DEET to prevent mosquito borne illnesses such as Dengue Fever and Chikungunya. Mosquitos will breed in greater numbers around flooded areas. The areas worst affected by Typhoon Haiyan are the islands of Leyte, Samar and Cebu; they are not affected by malaria so malaria tablets are not required for these islands. 3 Be vaccinated for Hepatitis A and Typhoid; update your tetanus injections as debris clearing will often result in injury. Have a flu injection, and speak to your travel Doctor about other vaccines you may need. water-affected electrical outlets, and interrupted gas lines. 5 Avoid stray or frightened animals. Seek medical help immediately if you are bitten or scratched by an animal and wash out the wound. Consider rabies vaccination before you go, or seek rabies vaccination within 48 hours of any animal bites.